28th June 2014 – Construction work today! Nobody seems to be sure whether it will rain or stay dry. I will not take the chance of painting the wheelhouse. Last year I had to remove the old sleeping accommodation. 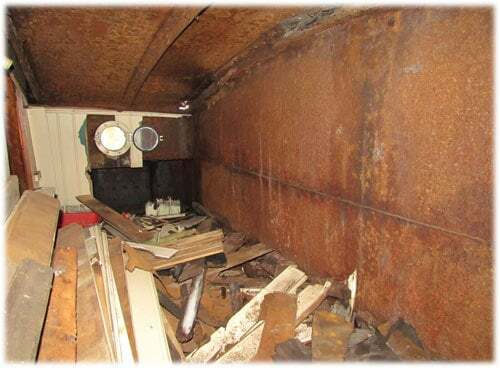 It was rotten, and there was a big risk of fire when we were welding near that bulkhead. Last month, I put the portholes back and now I can redo the interior. There used to be two boxes for sleeping. One has become the entrance to the hold. The second one will be for sleeping again. In the afternoon I made the wall between the entrance and the bed. I’m reusing the old furniture parts from the spits barge I salvaged earlier this month. Maybe I would have been quicker remaking it….